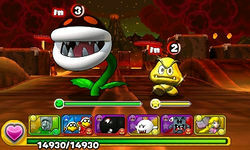 World 8-7 is the ninth course of World 8 in Puzzle & Dragons: Super Mario Bros. Edition. It is a basic, volcanic level with enemies consisting of a Fire Piranha Plant, a Flame Chomp, Red Koopa Troopas, a Fire Bro, a Bony Beetle and Coin Coffers. This course is unlocked by taking the secret exit in World 8-6. This level is straightforward, consisting of three battles (with two Coin Coffers of any color on the third battle), a ? Block, then a boss fight at the end with a Big Thwomp. The player has Fire, Water, Wood, Light and Heart Orbs on the Orb field for this course. Fire Piranha Plant ? ? Red Koopa Troopa ? ? ★World 8-7 is a difficult version of World 8-7 from ★World 8, with Dark Orbs appearing on the Orb field. The Fire Bro and Bony Beetle no longer appear in the second battle (despite the latter appearing in the "Enemies found here" listing for the course) as the battle is replaced with a ? Block. 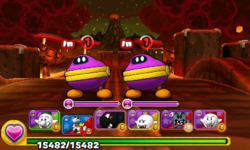 The third battle contains three Coin Coffers of any color instead of two. A rare Gold Goomba sighting in the second battle. Another Gold Goomba sighting in the second battle. This page was last edited on April 2, 2019, at 13:48.